Brandon is thrilled to support Stephanie in realizing her vision for Katie's Art Project. For two years, Stephanie and Brandon have worked together bringing Katie’s Art Project events and programs to life. Brandon is a proud graduate of the Ithaca College School of Music with plans to dedicate his life to the arts and helping others through performance and administration. In addition to his work with Katie's Art Project, Brandon is an avid runner who just ran his first marathon. Learn more about Brandon at brandonrschneider.com. Molly Richey is very excited to be a part of Katie’s Art Project. She is a North Carolina native, and attended the University of Colorado Boulder where she studied Spanish Literature and Ethnic Studies. Molly's diverse career started in Real Estate in Denver for 3 years before meeting her future husband and moving to Dallas, Texas. Once in Dallas, she became a bilingual teacher, teaching first through third graders 7 years. Molly received her Masters in Educational Administration from Lamar University, and later moved to Chicago with her Husband Brent, where they still reside. Molly has one daughter, Elizabeth. Molly truly believes in the mission of Katie’s Art Project and feels that creating a legacy for children who suffer from life-threatening illnesses through art and music provides an irreplaceable sense of consistency and calm during a somewhat chaotic time in their lives. It also provides a definite future where one may not exist. Molly is honored to be helping to bring this project to children in New York and Chicago. Clara is from Edmond, Oklahoma and graduated from the University of Oklahoma in 2016. She is currently a medical student at OU College of Medicine. Her journey began with Music is Medicine (MiM) and continues with KAP as the Campus Chapters Director! In 2014, she started the first student chapter of MiM with her founding team at the University of Oklahoma. She continued as a regional director in her state to advise her OU student community after she graduated. In 2018, she participated in the Music is Medicine program under KAP and recorded a song in NY called Strong Like Me for a patient named Charlie. Music has always been a big part of her life and she loves its ability to connect people together! As an aspiring physician and leader, she wants to give back to the patient population through multiple means. KAP is multifaceted and has allowed her to explore new areas of expertise and meet inspiring people from diverse backgrounds. Her work with the former MiM student chapter in Oklahoma has inspired her goal to bring the mission of KAP to talented students at different universities and facilitate awareness of this growing organization! She looks forward to meeting and speaking with all the interested student leaders in our nation by getting the opportunity to lay the foundations of this campus chapter program of KAP! Stephanie Klemons is an award-winning Broadway performer and creator. Currently, Stephanie serves as the Associate Choreographer & Global Dance Supervisor of Broadway’s Hamilton. She also Associate Choreographed Bring It On, and was an original cast member of In the Heights, as well as If/Then. In addition to a career on Broadway, Stephanie has created Theater regionally both as a Choreographer & Director. Some highlights include working with Frank Wildhorn on Zelda, getting nominated for a Carbonell Award for her work on In the Heights at Actor’s Playhouse, and most recently directing and choreographing the production of In The Heights at the incomparable Kennedy Center in Washington, D.C. She choreographed the now viral “Time of our lives” NFL Super Bowl Commercial, and has created commercials, content and episodes for Sesame Street, Victoria’s Secret, Vogue and Macy’s Thanksgiving Day Parade. Stephanie is a passionate educator, and philanthropist, and is most proud of the legacy her friends Katie & Abby left on her heart driving her to bring art to kids facing illness as a way of processing and leaving their mark. Her dream is to create a world where artists can easily access communities in need of their gifts. Learn more about Stephanie at stephanieklemons.com. 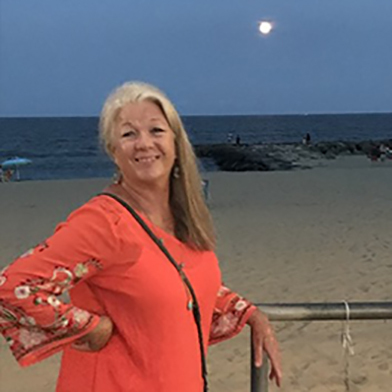 Mother of Katie Andryca, currently retired and living the beach life in Asbury Park, NJ...Loves Music, dancing, zumba, bowling, and an avid movie goer. Thrilled to be part pf Stephanie's dream to honor Katie and bring happiness and joy to those who most need it, the children whose lives are on the line with illnesses we have yet to conquer. Father of Katie Andryca, also living the beach life in Asbury Park, NJ but still working in Aerospace Industry after 40 plus years in the Financial markets. Love to fish, dance (to the right music), read, cook, and most recently, fly big kites. I am so honored that Stephanie has chosen Katie as a channel to help bring Art in all forms to those children whose lives begin and end each day in a hospital room. Rachel has been involved in volunteering with non-profit work for the past few years. After losing her first wife to cancer she created a community that gave money to those who were going through difficult illnesses and gave their families some hope and happiness. Rachel has now begun working with Katie's Art Project to bring in sponsorship's and donations. This is her way of helping to raise money for a non-profit near and dear to her heart. For the last 15 years Mary Pat has been the assistant to key executives in the classical performing arts, including the former General Manager of the Met Opera and, since 2009, the present Chairman of the Met Opera.Her current job involves communication and coordination with several charitable organizations specializing in the arts and education for a very active philanthropist. Her prior work experience has included positions in both business and not-for-profit in New York, California, Colorado and Virginia. As a former special education teacher and current Learning Disabilities Consultant, Cheri has been working alongside children for 26 years. She is an advocate of keeping the arts in education and in the lives of all children. Cheri and her husband, Keith are Executive Producers of the dance movies High Strung and High Strung: Free Dance. Cheri serves on the board of directors for another non-profit that helps to fund dance education for children that cannot afford it. She resides in New Jersey with her husband and two children, Zachary and Amanda.